Sometimes I have good ideas, like: I’m at my parent’s beach rental, its Labor Day weekend and this would be the perfect day for an early morning bike ride along the boardwalk. Only I’m not the only one to have this good idea. 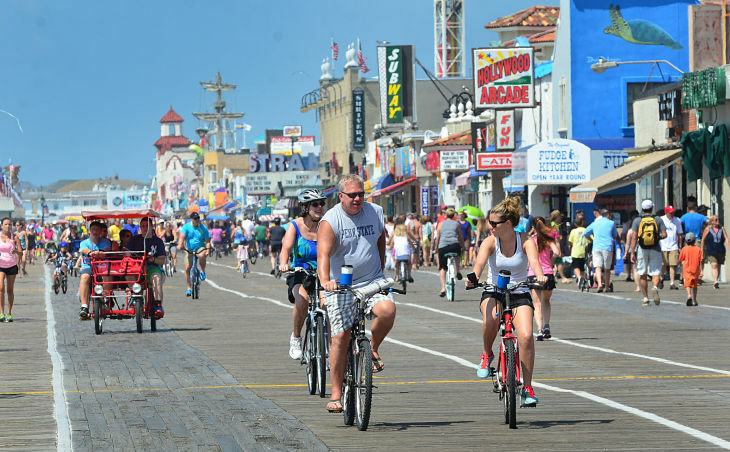 There are approximately 7 million people and their mothers who have this same idea, as if the entire population of South Philadelphia and then some has gone “down the shore” for the weekend. I figure out quickly enough to stay to the right, and to only swerve to the left when I have to pass someone but the Atlantic City boardwalk is a veritable South Beach: anorexic looking joggers, old women with fanny packs and rhinestone martinis on their t-shirts, couples strolling leisurely along hand-in-hand, kids learning how to ride bikes for the first time, tourists walking four or sometimes even five abreast, completely oblivious to the other 6.8 million people who are trying to exercise. It’s rather stressful. And I’ve forgotten to put on sunscreen. Then it starts to get windy. But I really need to start working out. It says so on the 9 Months Out Bridal Checklist I found on Pinterest. Plus, I’m 30 now. I’ve been cruising along on my “I was a dance major” body (which was never all that great in the cardiovascular department to begin with) for almost a decade now and it’s time to start making a serious investment in my health. Which is why I started the South Beach Diet. I lasted 2.5 days. Now I life weights while watching The Mindy Project and feel much better about myself. I even do crunches sometimes. But my house slants a bit so it’s hard to see the TV and get a good ab workout at the same time. Anyway, back to the boardwalk: I make it from Ventnor City to Atlantic City and back again unscathed. And I resolve to get up earlier next time because aside from the shrimpy little jogger who got a bit pissy at me for passing her on the left, that was kind of fun. Yeah, for sure. I just saw an episode of Chopped featuring the woman who owns Sage. She didn’t win but unlike all of her competitors, she was gonna donate the winnings if she’d won.